P.S. The item with the cross over it is an embedded rock, from which there is no relief. Are you permitted to move a loose rock lying inside a water hazard that interferes with your intended swing when your ball lies just outside of that hazard? Yes, except when both the loose impediment and the ball lie in or touch the same hazard, any loose impediment may be removed without penalty, providing the removal of the loose impediment does not cause your ball in play to move, Rule 23-1. If your ball lies on the edge of water inside a water hazard are you permitted to kick aside stones to improve your stance? No, before making a stroke at a ball that is in a water hazard you must not touch or move a loose impediment lying in or touching that hazard, Rule 13-4c. Read how Aaron Baddeley disqualified himself from a PGA tour event last year when he realised that he had broken this Rule. Can you break off part of a large branch of a tree that has fallen off in a storm and is interfering with your intended area of swing? Yes, if the branch is detached from the tree and is too big to move, you may simply break off part of the branch and play away, Decision 23-1/4. You may also obtain assistance to remove any large loose impediment, Decision 23-1/3. Am I permitted to remove clumps of sand from the apron of the putting green when they are in my line of putt? No, sand and loose soil are loose impediments on the putting green, but not elsewhere, Definition of Loose Impediments. Could you clarify if grass cuttings are considered to be loose impediments? I believe they are not when adhering to the ball. This is correct; anything adhering to a ball is not a loose impediment. Grass cuttings piled for removal may be treated as ground under repair and grass cuttings not intended to be removed are loose impediments and may be brushed or moved from the line of play, except when they lie in the same hazard as the ball, Rule 23-1, Definitions of Loose Impediments and Ground Under Repair. 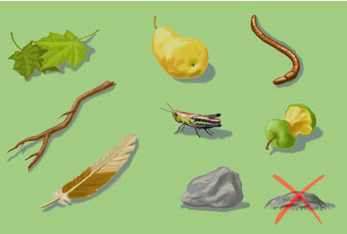 Do you have to pick-up loose impediments or can you brush them away with your hand? Loose impediments may be moved by any means, except that, in removing loose impediments on the line of putt, the player must not press anything down. Decision 23-1/1. Finally, keep in mind that loose impediments are natural objects (i.e. not artificial) that are not fixed or growing, solidly embedded, or adhering to the ball. P.S. My thanks to all of you who have emailed compliments to me about my weekly blogs and also to those who have forwarded the link to others who may be interested. It pleases me greatly to know that others are benefiting from my efforts. A ball lands on an existing hole/indentation on the green. He marked the ball and proceeded to fix the hole/indentation. Is that allowed? Rules 16 & 17 seem to suggest that it's not, "It is permissable to repair hole plugs and damage made by the impact of a ball on the putting green, whether or not the player's ball is on the gree, but other damage may not be repaired if it might assist the player in susequent play." If the existing hole/indentation on the putting green was made by the impact of a ball (anyone's ball) then it may be repaired, whether or not the player's ball lies on the putting green. If it was not made by a ball and is not an old hole made by a greenkeeper, then it may not be repaired. grass cuttings not intended to be removed are loose impediments and may be brushed or moved from the line of play, except when they lie in the same hazard as the ball, Rule 23-1.
i know this stands for a ball on the putting surface, but what if the ball is off the putting surface, say 5 feet & there are loose clippings around the ball (not adhering to it) & between the ball & the line of putt? Yes, loose impediments may be removed anywhere on the course, except when they lie in the same hazard as the player's ball. So, a player may remove grass cuttings on his line of putt when their ball lies of the putting green. However, in brushing away the grass cuttings they must be careful not to remove sand or loose soil, which are loose impediments on the putting green but not off it. A loose leaf lies behind my ball in a hazard. I cannot move the leaf. If my club moves or touches the leaf on my back swing, it's a 2 stroke penalty. So, what to do? Call the ball unplayable? Hit out at another angle so as to miss the leaf? You could take either of the options that you suggest, but most players would hover their club above the ball/leaf before starting their backswing and making their stroke. If my ball lies off the green (on the apron), I know I cant remove loose impediments that are also off the green (eg sand from a previous players bunker shot). Can I remove loose impediments that are on the green and on my line ? Except when both the loose impediment and the ball lie in or touch the same hazard, any loose impediment may be removed without penalty. If the ball lies on the apron (rather than the putting green) and there is a loose sand on the putting surface, can that be classed as a loose impediment and removed. This point has been the subject of many debates at my club. What is clear is that sand IS classed as a loose impediment if it is "on the putting green". The crux of the disagreement is whether "on the putting green" means that the ball must also be on the putting gree. There is a video on the R&A website dealing with what you can and can't do with things that might affect your putt on the green. It specifically says that you can repair a pitch mark whether or not your ball lies on the green but when dealing with sand it doesn't make the same specific reference to the ball being off the green. Can you also clarify how your answer is arrived at based on the rules/decisions of golf? Therefore, loose sand may be removed on the putting green, whether or not the player's ball lies on the putting green. Loose grass is not Ground Under Repair (GUR). When it is piled for removal by a greenkeeper it is an abnormal ground condition, from which relief may be taken; one club-length from the nearest point of relief, not nearer the hole. However, when clumps of cut grass lie on the course they are loose impediments and no relief is available. You may remove any of the grass surrounding your ball, but be careful not to move your ball, or you will incur a one stroke penalty and the ball must be replaced. So, unless your ball is in a bunker or a water hazard you may always remove loose impediments, whether they affect your lie, stance, line of play, or not. My Ball is in a hazard and a long twig behind might be loose or attached....how can I test for it without incurring a penalty. A player is entitled to move a natural object for the specific purpose of determining whether the object is loose, provided that if the object is found not to be loose, (1) it has not become detached and (2) it is returned to its original position before the next stroke if failure to do so would result in a breach of Rule 13-2. But, be careful, a loose impediment may not be removed in a hazard if the player's ball lies in that hazard, nor may a stroke touch it on the backswing. My ball had landed in a lateral hazard and did not reach the water and was still playable within the hazard. So before playing my shot I pulled some grass up from inside the hazard line to throw up into air to check the wind direction. Did I breach any rules by pulling up grass inside the hazard? A competitor of mine was entitled to relief from a cart path... prior to the drop, he "groomed" the drop area (packed dirt and small pebbles) with the palm of his hand, thus removing the small pebbles and smoothing the drop area. He did not think he broke any rules, but I beg to differ..... He eventually dropped the ball in a different area within his club length. We ended up tying the hole, but it created friction for the rest of the round.....was I correct? The player was permitted to remove small pebbles and clumps of earth from the dropping area before dropping their ball. However, they were not permitted to brush away loose soil, which is a loose impediment when it is on the putting green, but not elsewhere on the course. The penalty for doing so is loss of hole in match play. Yes, sand and loose soil are loose impediments when they are on the putting green and may be moved wherever the ball lies. If in the process of approaching a player's ball, particularly in the rough, the player stands on a loose impediment which results in the ball moving, does that constitute the player causing the ball to move? If the player was the cause of heir own ball moving, albeit without actually touching it, they do incur a penalty of one stroke and the ball must be replaced, Rule 18-2. If the ball belonged to a fellow competitor, no penalty is incurred and the ball must be replaced, Rule 18-4. With regard to loose impediments, when you've got small twigs, leaves etc that have fallen from trees, what is the situation if, for whatever reason (how they fell from the tree, someone stepping on them, muddy ground etc. ), these items are slightly stuck into the ground or entwined in the grass ? I had a situation where, in very soft turf, the tips of some small twigs were sticking slightly into the surface, nothing too deep, just enough that I was wondering if I was allowed to remove them as normal ? A natural item is not a loose impediment if it is "solidly embedded". This seems unlikely in the case of fallen twigs, leaves, unless they have been trodden into the earth., in which case they may not be removed. Loose grass adhering to a ball may not be removed (unless the ball may be cleaned under a different Rule). Growing grass is not a loose impediment and may not be removed. Barry, my question is regarding a ball in a water hazard. A guy in my group (reputation of being lax with the rules) bends down and removes a twig. I called him on the infringement. He then decided to take a penalty drop. I was of the opinion that there are two distinct penalties... The first touching anything in the hazard and then the penalty drop. His marker 'graciously' gave him just the latter penalty stroke. What's the ruling? The second incident (boy, what a round this was) a few holes later when he pressed down on his line on the putting green. "I was repairing damage!" was his explanation. I didn't see any repairs going on. Once again, his marker let it go. The SOB made the putt, just to rub salt into the situation. Thanks for the informative page. Keep up the great work. You are correct. Penalties were incurred for two unrelated,separate breaches. Decision 1-4/12 is worth checking re when multiple penalties apply. The marker should also have been disqualified for attesting the score on the hole without including a penalty that he knew had been incurred! A player may always repair damage on a putting green caused by a ball. If the repair was of any other damage (excepting an old hole plug) then a penalty of two strokes was incurred. Drop Within One or Two Club-lengths? Has Phil Mickelson Been Bending the Groove Rules?